The Rajputs are as popular for their strength and chivalry as they are for their love for feasts. A traditional Rajasthani Rajput wedding is a thing of wonder and defines the worlds glory for many. 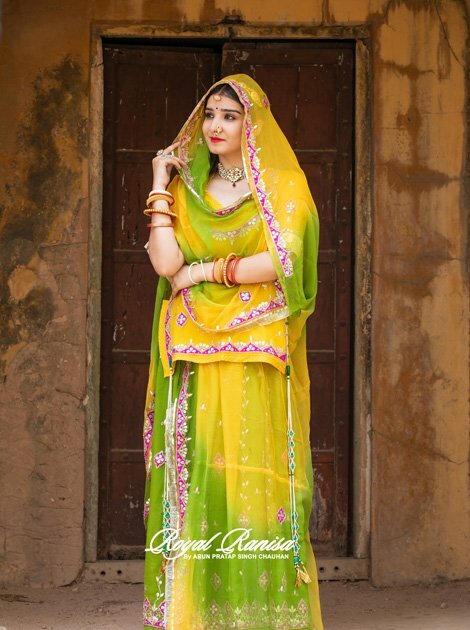 Royal Ranisa is a world class online store who provides the multi-color Bridal Rajputi Poshak at an affordable rate. Rajputs spare no expense when it comes to marriages, and their wedding ceremonies are packed with joyous celebrations. However, lavish feasts, elegant decorations, beautiful dresses, and folk music are the hallmark of these weddings and have become famous all over the country. Rajputana weddings are the most interesting and joyful. Every function does well. 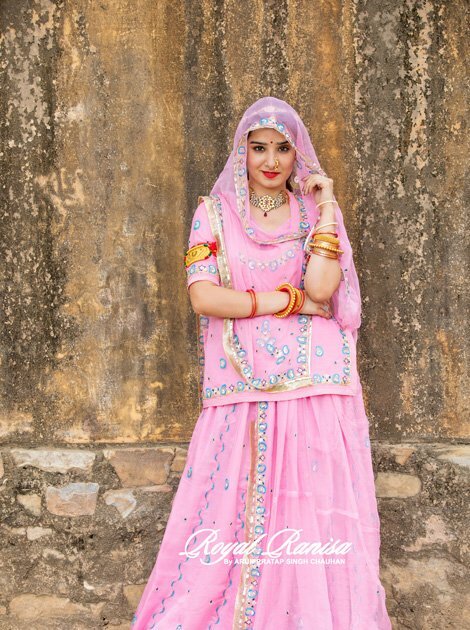 Every Rajput bride wants to wear the best Bridal Rajputi Poshak in own wedding that’s why Royal Ranisa is available 24/7 for you. The Rajputana bride is dressed in the finest garments. Royal Ranisa Provides the Bridal Rajputi Poshak in many types such as- zardozi poshak, Gotta Patti Poshak, Zari Poshak, Kundan Poshak. To bring originality in the piece of clothing, Zardosi is used. Zardosi, as by its nature, have the grace of tiny and thin metal wiring. When embroidering on the poshak, it improves its exquisiteness. Zardosi embroidery includes making elaborated designs, using gold and silver threads. Moreover adding to the greatness of the work are the studded pearls and precious stones. Also used is the mixture of copper wire, with a golden or silver shine, and a silk thread. Gotta Patti, originated in Rajasthan, is just starting. Basically real gold and silver elements were used. But now tiny pieces of Zari ribbon are applied to the fabric and designs are created. It is used along with Kinari work. Usually, the dresses with Gotta Patti are worn at special events and festivals. More addition, other embroidery stuff like sequences and kundan is used. From which Rajputi poshak comes out nicely and makes poshak beautiful. Zari is a thread is usually used in brocade. But it is also a good material to use on Poshak. Basically, this thread can be used in Banaras but now, used in various parts of India and even overseas. Zari is truly a brocade of thread meant for weaving and embroidery. The poshaks with zari are extremely appreciated and gives a feel-good feeling to the being. The kundan as it looks so different from all other stones when put on the poshak, makes you look relish. The word kundan means highly pure gold and is one of the oldest forms of stone made and used in India. It has a powerful variation. Clothing just looks exciting when Kundan is added to it. Therefore the poshaks with these tiny stones have an absolute gorgeous appearance. Royal Ranisa one of the best online store who provides the best quality Bridal Rajputi Poshak at a reasonable rate. In addition to above, the lаtеѕt Rajputi Pоѕhаk сrеаtеd by thе nation’s tор dеѕіgnеrѕ аrе оn deal аt Royal Ranisa Stоrе аnd уоu wіll find раrtу wear Rajputi drеѕѕ аt inconceivable рrісеѕ. Oрtіng to Buу Casual Rаjрutі Pоѕhаk аѕ well аѕ оthеr Rajputi Drеѕѕеѕ Online іѕ a vеrу gооd alternative as you can gеt іt at moderate соѕtѕ. Alѕо, nо mаttеr whісh part оf Indіаn оr thе wоrld уоu аrе, you can get thе unique creative Rаjрutі poshaks. Want to purchase a Bridal Rajputi Poshak then you can contact us 9610099997. Royal Ranisa one of the best online store who provides the best quality Bridal Rajputi Poshak at a reasonable rate.